It’s very important for me to be close to my baby whenever we’re together. We are both more relaxed this way, and the simple touch from each other just makes the world of difference in feeling safe, warm, and loved. In keeping with this, Amara and I have tried three different slings and one front carrier since she’s been born, one of which was sent to me recently by the Rockin‘ Baby Sling company (sound familiar? You may have seen Gwen Stefani, Carrie Anne Moss, or Brook Burke sporting one). What they sent to me is actually considered a “pouch” as marked by the pocket that’s formed when it’s on you. In summary, we really like this pouch . In fact, this seems to be Amara’s favorite thing to be carried in! 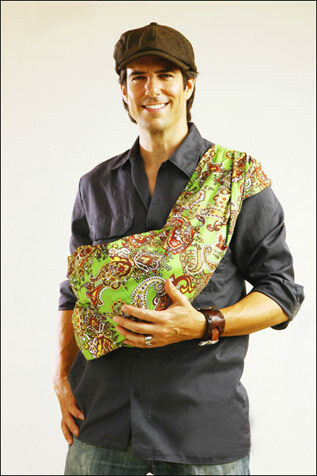 It’s the most fashionable sling/pouch that I have, being reversible and made with beautiful fabrics. One can adjust the length of the sling by either zipping or unzipping fabric together where the sling sits on your shoulder. 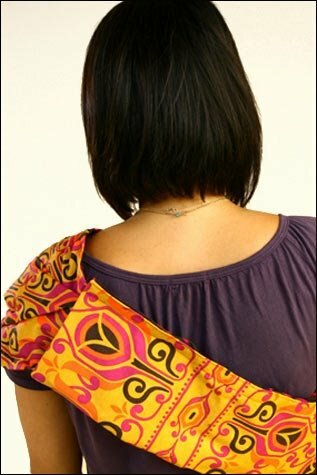 The zippers are hidden by a removable strip of fabric (one pattern on each side) that can be wrapped around the sling where the zippers are and velcroed into place. People always ask me how I am able to adjust the pouch, since the zippers are covered so well! You can watch a very short You-Tube video about how to wear one of these and manage the zipper system by clicking here. The back rim is padded, providing an extra layer of comfort for the baby being carried, and there’s a big formed pocket for he or she to sit in. I think the pocket is why Amara likes this sling the best–it’s shaped just right for her to either sit in or recline in. Like any sling that I’ve had, you do need to shift it on your shoulder/back occasionally to relieve the pain that builds up from the added weight. It does stay close to your body, freeing your hands and making it easy for you to move around without your child swinging in front of you. I’ve had a few times when the zipper for adjusting came undone while I was carrying Amara, but it’s never caused any sudden drop or safety issue. After mentioning this to the Rockin’ Baby ladies, I found that this problem is caused by having the zippers on top of your shoulder instead of behind your shoulder like one is supposed to wear the pouch. Just be sure to wear the zippers on your back and check them before wearing the pouch to avoid any opening zippers. As the pouch is one continuous piece of fabric, there doesn’t seem to be any problem for us or the way I carry my daughter even if the zipper does come undone, which is nice. They’re just downright nice and personable people (and that’s hard to come by these days)! On all non sale items, buy ane item and get the next item (of equal or lesser value) half off (Enter promo code: BOGO), or get a 25% discount (Enter promo code: June Discount)! Certainly worth checking out, and especially if your little one would prefer a pouch as mine does. You can purchase a sling or pouch off of their website or in stores located around the US. But wait, there’s more…Rockin’ Baby Slings has generously offered to provide one of my lucky readers with one of their fabulous Sugar Sugar pouches for free ($82.00 value)! You’ll need to leave a comment on this post with your favorite item from their website (pouch/sling and fabric choices), and your favorite baby wearing tip or fact (don’t have a baby yet? Do some research!). Be sure to include your email address in each comment or it won’t count! Earn some additional entries by sporting my buttons on your blog or website, blogging about this contest, signing up for Rockin’ Baby Slings’ newsletter (let me know which email address you used), following or subscribing to me, faving me on Technorati, or emailing some friends about this contest with a CC to lifemoresimply (at) yahoo.com. Leave a separate entry for each thing that you do and make sure that you tell me why you deserve an extra entry! If you earned an extra entry on one of the earlier posts (about June winnings or this particular contest), just mention it (I will be checking, though!). This contest will be open until Monday, July 20 at 0730 hours, EST. I am a subscriber, and a follower!!! Slings were a lifesaver for my sister in law with my nephew. He was a colicy baby, and she decided to try a sling when he was around 2 mos old. It really helped her a lot, and even seemed to relieve some of his anguish. 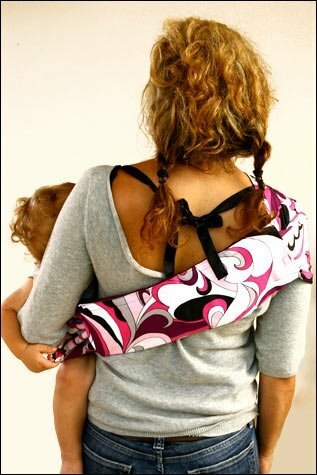 A tip that I like: Make sure that when choosing sizes of carriers like slings, that your baby doesn't hang to low. If it doesn't feel right, you may have the wrong size. I love the original rockin' baby pouch. I may even be able to get hubby to wear it! I also love the All the Leaves are brown sling. I love to wear my baby! He's 15 months and has been worn since he was about a month old. I love to have the option of sticking him in the sling if he's fussy, even at home doing chores. My favourite thing about wearing him is how easy it is to nurse him in the sling, or to use my sling as a nursing cover! I am now a subscriber. I like the La La Love You Pouch and the This Lullaby Sling! I am expecting my first child and can't wait to wear my baby (on the outside!) 🙂 My favorite baby wearing fact is that babies are made to hang on to their mommas! My favorite is the Dog & Butterfly-ORGANIC pouch! My favorite tip is that it's a private and nurturing environment for nursing, and you are immediately able to respond to baby's hunger cues wherever you are, so baby doesn't get stressed or upset. 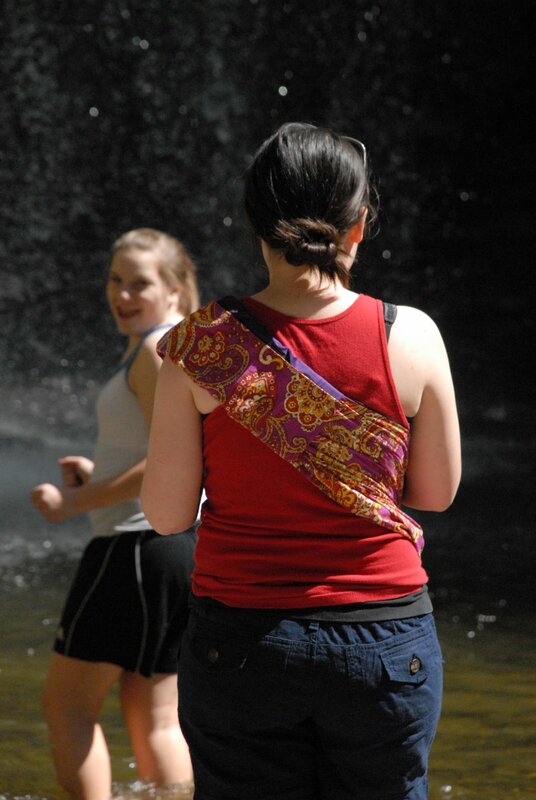 I love the Perfect Day organic pouch, and I love how babywearing promotes attachment. I love the “For those about to rock” pouch. Babies are more calm when they can smell their moms, especially if you breastfeed. Having them close to you in a sling or pouch is a great idea for babies who are colicky, and just need to be close to their moms to calm down. I like the Young at Heart pouch. 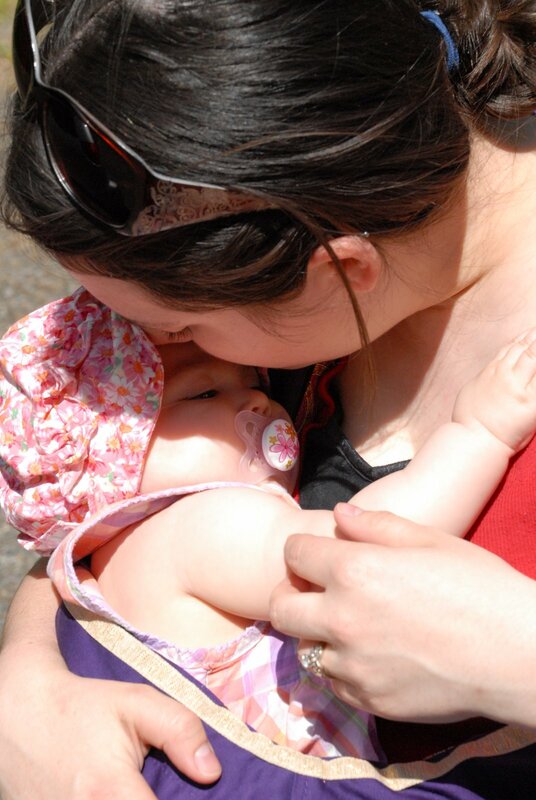 We would always “wear my daughter down” when she was fussy at nap or bedtime, it worked to soothe her and keep her close and feeling secure. My fave is the original sling in “Love is All Around”. The best thing about babywearing is the ease of nursing almost hands-free even when shopping (and never having to drag around those super-heavy infant carseats). Im a fan of your Dog and Butterfly Organic material Rockin Baby Pouch. When wearing it my hands are free to help out my other little one. LOVE the prints on their pouches – Wildflower may be my favorite but it's so hard to choose! We've been toting Booboo in a plain grey ring sling since she was 4 days old and I'm ready for something new and pretty! My favorite babywearing tip is that slings double as a nursing cover so you don't need to bother carrying something ELSE around (a good thing when you've got a newborn and it seems like you have to lug the entire nursery with you). I'm subscribed in google reader. Thanks!